A beautiful collectors' edition of this classic Moomin story, using original 50s and 60s cover artwork, gorgeous endpapers and including for the first time a special prologue written by Tove but never before published in the UK. 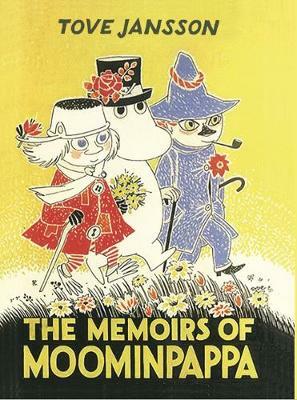 So begins the remarkable Memoirs of Moominpappa, a book written to delight his dear son Moomintroll and friends. What follows is a story about storytelling itself. Moominpappa weaves one fabulous tale after another, writing at night to read aloud by day and featuring not only the fearless, adventurous author but also the fathers of Sniff and Snufkin - the rather muddled Muddler and the carefree Joxter. Add to this mix the genius inventor Hodgkins and a grand finale in which Moominpappa rescues a shipwrecked Moominmamma from the waves and the fun becomes irresistible. The Memoirs of Moominpappa, was first published in the UK in 1950 under the title The Exploits of Moominpapa. In the early 1960s Tove Jansson substantially revised this text, redrawing pictures and reinstating her preferred title. This is the very first time the revised edition has become available in the UK. From the publisher of The Invisible Child and The Fir Tree (all proceeds to Oxfam) here's the Moomin gift editions.